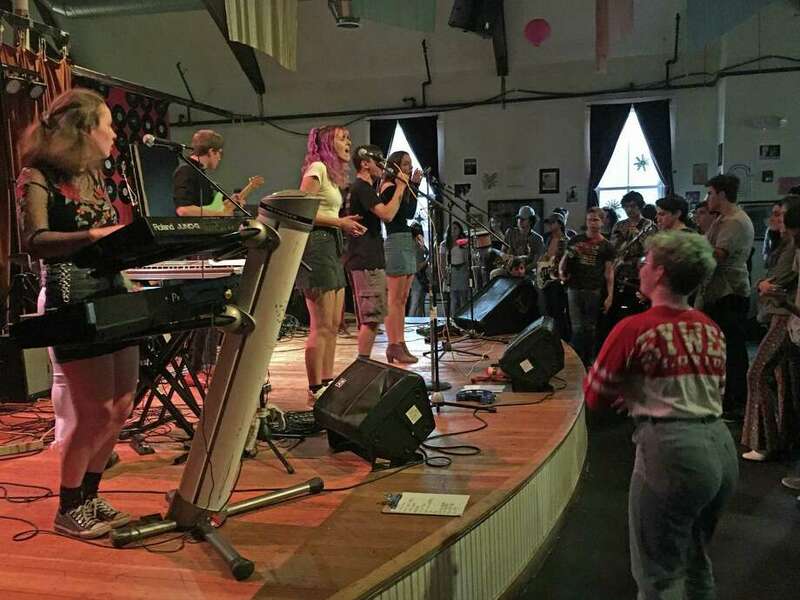 Weston student Madeline Hensinger performs a Van Halen cover with the Fairfield School of Rock's House Band at the Toquet Hal Teenl Center in Westport on April 6, 2019. WESTPORT — With the level of musical skill students showcased at Saturday’s Rock-Off, it may be hard to believe the adults snapping pictures in front of the stage are just proud parents saving the moment. The show, held at the Toquet Hall Teen Center, was produced by the School of Rock, where students learn how to play and perform various instruments through private and group sessions, becoming gigging musicians in their communities, according to its website. The concert hall was filled with band members from the school’s Bedford, N.Y., Fairfield and Westport locations, as well as parents and fellow students who came out to support their friends. Madeline Hensinger, 17, a singer, electric bass player and senior at Weston High School, was among the performers from Fairfield’s location. She, like many of her peers, has been participating at the school for several years. This was her first performance since she had been accepted into the House Band — a band with members selected through an audition process — and has the “best of the best” students in each location, according to Hensinger. Each set brought forth charismatic performers, with strong stage presence and artistic range as they tackled famous songs across many genres. There were several sets of funky and energetic renditions of famous classic rock, metal, R&B and country hits. Some of the sets included “One of these Nights” by the Eagles, “Montana” by Frank Zappa, “Do I do” by Stevie Wonder and even Rage Against the Machine and Van Halen covers. Simon Fleischer, 14, of Ossining High School, said he practices 45 minutes to an hour everyday since he started three to four years ago. Fleischer plays drums and is in Bedford’s House Band. On average, he said it takes around a month to get the songs really in shape. Kevin Godburn, the hall’s youth services program director, started working at Toquet Hall in 2009 after leaving a small marketing company right out of college. Even with the late nights as he gets older, he said he loves his work. The School of Rock seemed like a natural fit for the center, according to Godburn, who said the hall’s purpose is to be a safe social and creative space for local teens, noting the family environment the music school cultivates. For each solo, the group of teens in the front row would round up, motioning guitar picking and piano keys with their arms outreached to the front of the stage like starstruck fans. “There’s no better feeling than to see a kid just totally rock out and leave the stage with a huge smile on their face,” he said.